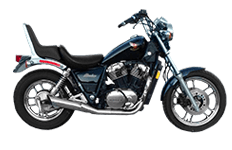 Honda's Shadow series of motorcycles is one of the manufacturer's leading lineup of bikes, and the VT 700 features quite a distinguishable look from the rest of the field. Matching the right accessories to one of these beauties is no easy task, but when you find that perfect aftermarket gear, you'll know. That's why we proudly feature a full collection of Viking Bags luggage for the Honda Shadow, and riders can find a saddlebag for their own specific needs. From fashionable to functional, we've got you covered! Just check each of the model pages for more information.